4 What Kind of Dinners Can I Make With Cream of Potato Soup? 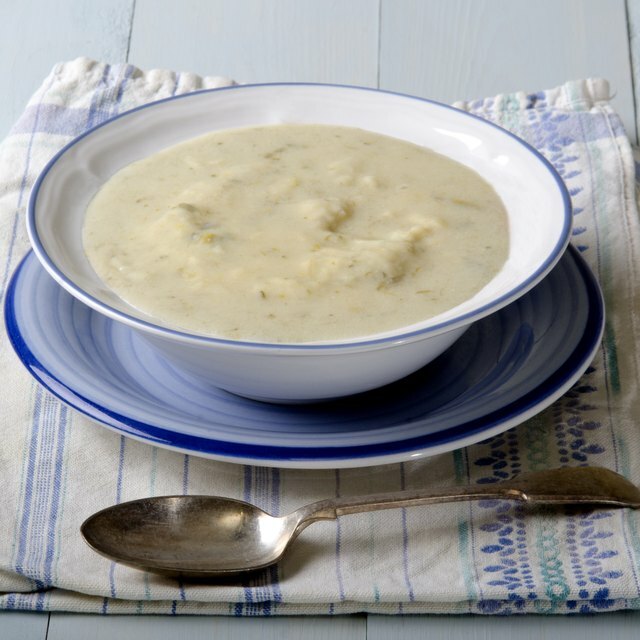 Potato and leek soup is a classic of French cuisine. There, it is known as potage parmentier after Antoine Augustin Parmentier, who helped popularize the use of the potato in Europe in the 18th century. He thought it was an excellent and nutritious food for the poor. Despite its humble origins, however, this is a soup suitable both for everyday meals and fancier occasions because of its richness and the slightly unusual flavor of the leeks. This recipe is adapted from Dorie Greenspan. Melt the butter over low heat in a heavy soup pot or Dutch oven. Add the leeks and saute them until they are soft and beginning to turn translucent, about 10 minutes. Add the potatoes, broth and milk. Raise the heat and bring them to a bare boil. Lower the heat, partially cover the pot and cook at a low simmer until the potatoes are completely soft, which is about 30 to 40 minutes. Puree the soup in a blender, food processor or with an immersion blender or pass it through a food mill. Add salt and pepper to taste. Ladle the soup into individual bowls and garnish with the snipped chives. Use white pepper if you want to avoid black specks in the finished soup. Garnish with snipped parsley instead of chives if you prefer. Or garnish with small croutons or diced roasted potato. Enhance the flavor with herbal seasonings. Add a bay leaf for flavoring when you add the potatoes and liquid to the pot, but remove the leaf before blending. Or add fresh or dried thyme, sage or tarragon when adding the liquid to the pot. Substitute water for the stock in a pinch. If you serve this soup chilled rather than hot, you have another classic French preparation known as vichyssoise. Be careful when using a traditional blender on hot liquids. The soup can jump up and splatter, causing serious burns if the hot liquid spills onto skin. To avoid this, fill the blender jar no more than halfway, start on a low speed, place a dry towel over the blender lid and hold it down with your hand. Too much blending can cause potatoes to have a gluey texture. Using a food mill avoids this problem.